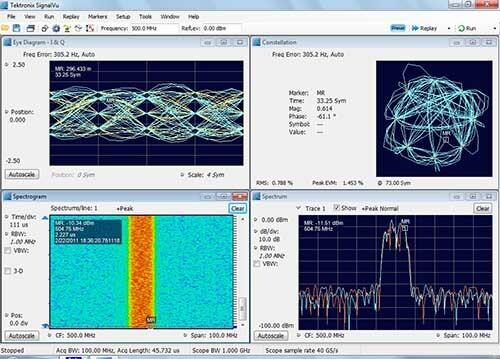 Standard analysis tools include 53 automated measurements, measurement statistics, histograms, limit testing, advanced waveform math, user-definable filters and support for custom MATLAB and .NET math plug-ins. Specialized applications such as advanced jitter and eye analysis, and wideband RF analysis, can be added to extend the measurement capabilities. Easily capture signal anomalies, including glitches, runts, setup/hold violations and NRZ pattern lock for serial data streams up to 1.25 Gb/s, with Pinpoint® triggering and Visual Trigger and Search. 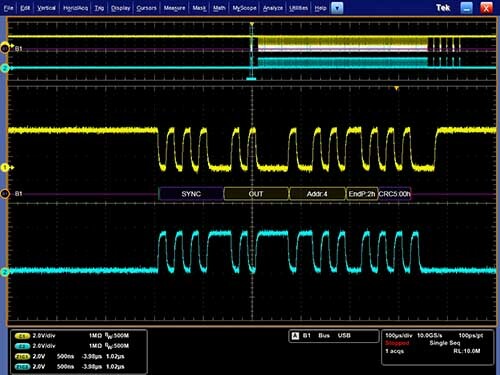 Simplify advanced system design debug and verification with protocol decode and serial trigger options for low- and mid-speed buses. Ensure interoperability of mid-speed serial buses with automated compliance testing. Automated measurements and reporting ensure simple, repeatable power quality, switching loss, magnetic loss, harmonics measurements and more meet the measurement demands of today’s efficient power converters. Plus, smart TekVPI current and differential probes reduce uncertainty and eliminate power measurement pitfalls. Automated measurements and reporting ensure simple, repeatable power quality, switching loss, magnetic loss, harmonics measurements and more to meet the measurement demands of today’s efficient power converters. Plus, smart TekVPI current and differential probes reduce uncertainty and eliminate power measurement pitfalls. Simplify automotive system design debug and verification with protocol decode and serial trigger options for CAN, LIN and FlexRay buses. Ensure interoperability of BroadR-Reach and MOST serial devices with automated compliance testing. Protocol decode, serial triggering, and analysis for I2C, SPI, RS-232/422/485/UART, USB 2.0, Ethernet, and MIL-STD-1553B simplify advanced system design debug and verification. Ensure interoperability of USB 2.0 and Ethernet serial designs with automated compliance testing. 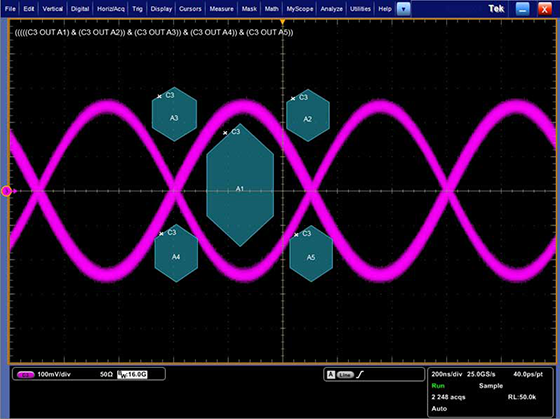 With comprehensive jitter and eye-diagram analysis, plus decomposition algorithms, DPOJET simplifies discovering signal integrity concerns and jitter and their related sources in today's high-speed serial, digital and communication system designs. 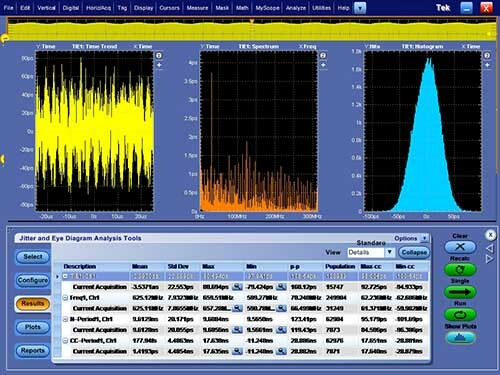 SignalVu RF and vector signal analysis software provides the functionality of a vector signal analyzer and spectrum analyzer, with the powerful trigger capabilities of a digital oscilloscope—all in a single package. 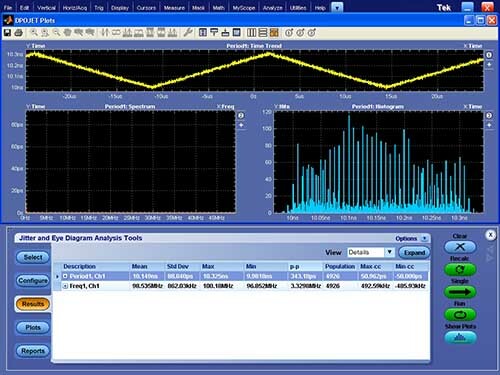 Use SignalVu to easily validate wideband designs and characterize wideband spectral events. 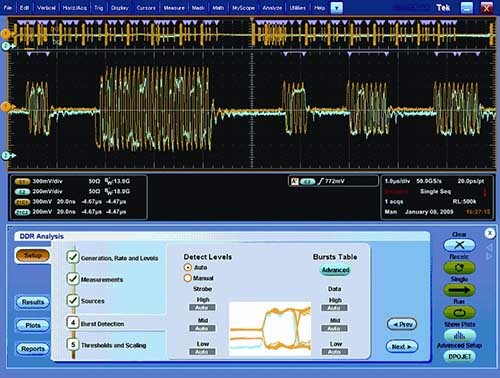 Verify to the MIPI D-PHY specification by rapidly characterizing and discovering sources of jitter and signal integrity concerns using the fully flexible and customizable test setup. Using DPOJET, Option D-PHY enables transmitter high-speed data-clock timing measurements, along with a full range of electrical characteristics in high-speed or low-power modes. Automated characterization, compliance and full PHY layer support for 10BASE-T, 100BASE-TX and 1000BASE-T.
Electrical compliance and debug test solution for MOST50 and MOST150 host and device designs. Compliance verification and interoperability testing to communication and computing serial standards masks. Power measurement and analysis solution for characterization and testing of power devices and power supplies including power quality and harmonic testing. 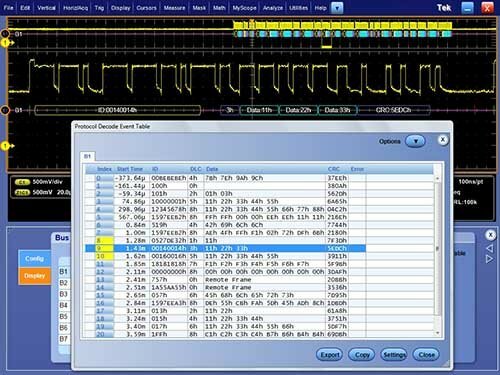 Quickly analyze 8b/10b serial buses with automatic decode and search on serial packet content.